The warehousing we offer occupies a 1.5 acre site, consisting of 80,000 sq ft of Industrial and Warehousing space which has been separated into flexible connecting units. Our industrial units to let are amongst the best on offer across Greater Manchester, in terms of both quality and value. 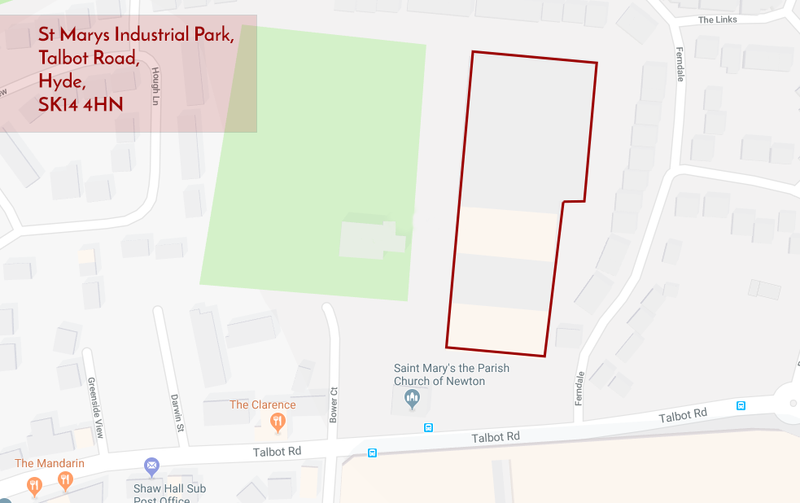 We offer units ranging from 4000sq ft to 80,000sq ft, and the size of an individual unit can be varied depending upon the lettings taken up at any given time. The fact that we can be flexible in this way is just one of the reasons why many of our clients stay with us for many years, secure in our ability to adapt our facilities to meet their changing needs. One of the main advantages of our industrial units to let in Greater Manchester is the strategic importance of our location. We are based just 5 minutes away from the M60 ring road, providing quick access to the motorway system across the North West, and are also very close to Hyde town centre and major bus routes and rail links. The fact that Manchester International Airport and Manchester Piccadilly train station are both just 20 minutes’ drive away, makes St Marys Industrial Park the perfect base from which to access the whole of the UK and Europe beyond. We have been providing industrial units for over thirty years, and in that time we have always endeavoured to offer the speed, simplicity and transparency which our customers value. Our small team is focused on providing excellent customer service and keeping prices as competitive as possible. Our industrial units to let in Greater Manchester are constructed without the use of supporting columns, maximising the space available and the flexibility of each individual warehouse. The units have an eave height of 5.2m and enjoy excellent concrete floors that have been shot blasted and painted. All of our Units have gas, water and electricity, with several of our units also equipped with docking levellers. In order to maintain security, all units have fitted with intruder alarm systems, externally, the site is protected by both CCTV and palisade fencing. Whether you need storage, manufacturing space or a combination of the two, contact us today on 0161 368 8111 and we will outline exactly what we can do for you.